It was gonna take something rather special to knock House of Cards off its’ perch as the top Netflix own show, but the debut season of Narcos definitely stakes a very strong claim to be the king of the castle with an explosive story that intrigues and delights in equal measure. Narcos tells the story of the godfather of drug kingpins, Pablo Escobar, and the efforts of the Colombian police, Government and the US DEA to catch him. It follows a very Wire-esque feel of building the case from both sides of the story, playing both the heroes and the villains in a grey light where each can be seen as likeable or loathable in equal measures. It’s got that Breaking Bad style quality of not quite knowing who to root for and changing your mind as events unfold. From start to finish you feel a part of the world of both Pablo and the agent tasked with catching him, Steve Murphy. For a show that takes place mostly in Spanish, it’s testament to the great acting performances that it never feels as though you are “reading” the show. Wagner Moura’s star turn as Pablo is likely a nailed-on certainty when the acting awards roll around next year, being a stoic and cold figure with just enough to draw you in and make you care about him. It’s an impeccable performance that adds loads to the show. Also good are the two detectives Murphy (Boyd Holbrook) and Javier Pena (Pedro Pascal) whose camaraderie improves over time and feels very natural. And what Narcos does phenomenally well is making sure there’s action in each episode. In its 10 shows, it packs in over a decade’s worth of twists and turns in the fortunes of the Colombian drug world, and there’s never a dull moment. Rags to riches doesn’t quite do the transformation for Pablo justice, but the transition is covered very well and informatively. What I like about the show is that it is so neatly grounded in history and how it is a real story so eloquently told with real drama. Video footage and pictures of the real characters are interspersed through the episodes with Murphy’s actor narrating over it, constantly reminding you that this fantasy and this horror was actually lived out in Colombia thirty years ago. It feels more like a living, breathing documentary at times. Without giving too much away of the plot the escalation of drugs and violence throughout the season gets progressively grander and the stakes of catching Escobar do as well. While the last two episodes might be slightly quieter, the tension mounts as things go against the plan of Pena and Murphy and they’re forced into action that puts them in danger. The show doesn’t quite have an ending that’s as explosive as the rest of the season, but it sets things up nicely for what will be a very interesting second run. This show has everything you could ask for: exciting action, tremendous acting and a story that keeps you guessing and intrigued. 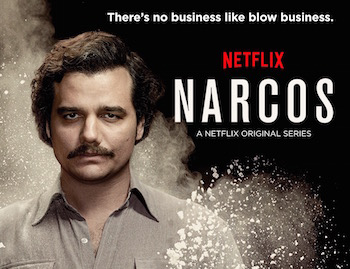 Narcos is another hit for Netflix, and it gives the platform yet another series that viewers can be left on tenterhooks for until it comes around again the following year. This is as good as Netflix gets. Make sure to catch Narcos.